Before, during and after the Philadelphia Eagles’ thrilling 41-33 victory over the New England Patriots in Super Bowl 52, AT&T, Verizon Wireless and Sprint said they saw a combined 50.2 terabytes of cellular traffic Sunday in and around U.S. Bank Stadium in Minneapolis. Though some of the totals represent different widths of coverage areas, they roughly correspond to metrics used by the same carriers at last year’s Super Bowl 51 in Houston, where a combined total of 25.8 TB of cellular traffic was reported. Like last year, T-Mobile representatives said they will not report data use from the Super Bowl, even though the carrier’s executives Tweeted Sunday night about strong network performance and significant data-use growth over last year’s big game without mentioning any totals for either. Without any agreed-upon standards for such reporting, it’s probably not an exact science to compare one year’s results to the next since numerous variables exist, like density of fixed and portable networks, and location of stadiums (Minneapolis’ U.S. Bank Stadium, for example, is in the middle of a downtown, while NRG Stadium, home of Super Bowl 51 in Houston, is not). Still, since carriers typically use the same reporting metrics year by year, it’s possible to see a continued increase in data use, a sign that demand for mobile connectivity at sporting events continues to grow. Curiously, AT&T saw a slight decrease this year in the amount of traffic it measured directly inside and immediately outside the venue; according to AT&T, it saw 7.2 TB of traffic on Sunday on the in-stadium DAS as well as on its mobile cell sites and macro sites just outside U.S. Bank Stadium. In 2017, AT&T said it saw 9.8 TB of traffic in similar locations around NRG Stadium in Houston. But in extending its reporting to a 2-mile radius around U.S. Bank Stadium — the same base metric used by Verizon — AT&T said it saw 21.7 TB of traffic Sunday. Verizon, which reported 11 TB of traffic last year in Houston, said it saw 18.8 TB of cellular data used on its networks inside the 2-mile perimeter around U.S. Bank Stadium Sunday. Verizon did not report a figure for its infrastructure inside and adjacent to the stadium. 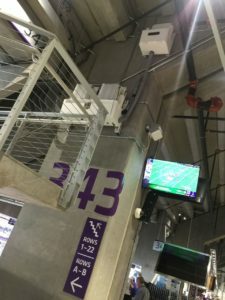 The main cellular infrastructure inside U.S. Bank Stadium, a neutral host DAS, was built and is run by Verizon. Sprint, which reports traffic each year from networks inside and directly adjacent to the stadiums, said it saw 9.7 TB of traffic on its networks Sunday, up from 5 TB in 2017. Again, according to Verizon the largest spikes in traffic happened with “social media video sharing” during the halftime performance at the top, followed by reaction to the Patriots’ fumble late in the game, and at kickoff, when Verizon customers were streaming video and browsing the web. Verizon also said its network was used by 57 percent of the fans at U.S. Bank Stadium, which may explain why Verizon spent a lot of time and money upgrading the network before Sunday’s event. We have also heard that the Wi-Fi usage also broke previous records, but do not yet have an official number to report. A final note: Thanks to all the carrier representatives for their figures and to all our Twitter followers for input and advice on how to best present these important metrics. We’ll keep working to make this process as best it can be, so let us know what you think!